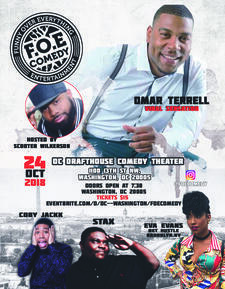 FOE Comedy presents Funny Over Everything Comedy Showcase featuring the hottest fresh new faces of comedy. This month featuring Eva Evans from (BET hustle in Brooklyn) and from DC Omar Terrell aka Viral Sensation Hilarious Omar!! We also got Coby Jackk and Stax!! !